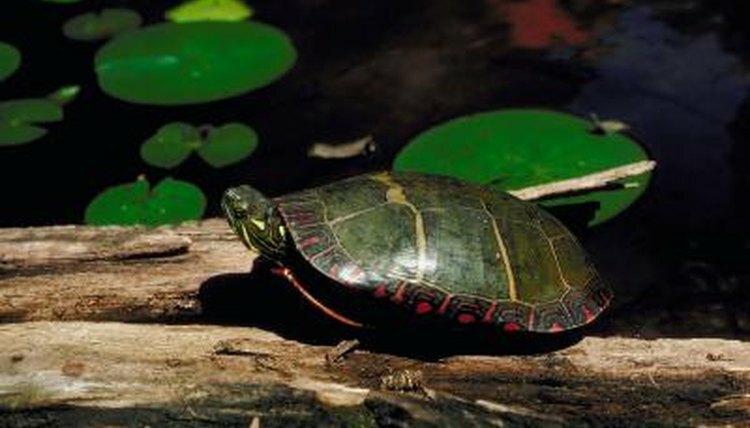 Though all turtles breathe air, aquatic turtles such as sliders (Trachemys scripta) and painted turtles (Chrysemys picta) can stay underwater for quite some time. Because of their slow metabolisms and adaptations for extracting oxygen from the water, some species can even spend the entire winter underwater. Turtles are ectothermic animals, commonly called "cold-blooded," that warm their bodies via external sources like warm water and sunlight. While a turtle’s metabolic rate is always rather low compared to warm-blooded animals, it does fluctuate with the temperature. When the temperatures are cool, the metabolism of a turtle is slow; when the temperatures are warm, the turtle’s metabolism speeds up. The faster the metabolism is, the more oxygen a turtle needs. Most often, pet turtles will only stay underwater for a few minutes at a time. In warm temperatures, where most pet turtles are maintained, they must breathe regularly. At night, this may change as your pet’s metabolism slows a bit -- sleeping turtles may stay underwater for a few hours at a time. Few studies exist documenting the breath-holding behavior of turtles while at high temperatures -- most work has been done on hibernating turtles. One exception is a study conducted in 1970 by C. Lenfant , et al, of the University of Washington. This study observed the breathing behavior of the mata mata turtle (Chelys fimrbiata). In the study, turtles held their breath for an average of 35 minutes when undisturbed. Some aquatic turtles from northern areas will hibernate underwater. Typically, the turtle swims to the lake or river bottom and buries itself in the substrate, at which point the turtle's metabolic rate drops significantly and the turtle needs little oxygen and no food for a period of months. During this time, most turtles absorb some of the oxygen they need directly from the water via specialized structures in the throat and cloaca. Sometimes, oxygen levels in the water can drop dangerously low, particularly in extremely cold lakes. Snapping turtles (Chelydra serpentina) and painted turtles are able to survive in these anoxic waters by using anerobic metabolism and active chemical buffering processes. Scientists have studied breath-holding behaviors in sea turtles more thoroughly than in freshwater turtles. The leatherback sea turtle (Dermochelys coriacea), a species that frequents cold waters, holds the record for holding its breath -- just over seven hours spent underwater. While the biology of sea turtles differs greatly from freshwater turtles, it's possible freshwater turtles are capable of similar feats, even at high temperatures.